With a wingspan of 200 - 300 mm, the Pond bat is the largest of the three trawling Myotis. Its dense fur is of a pale grey-brown colour, while its snout is red-brown. 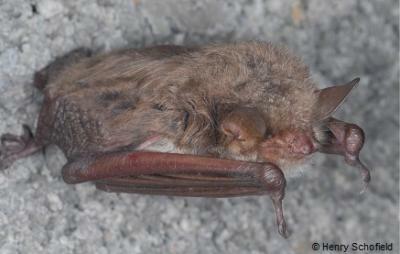 In addition, the Pond bat has large and strong feet and its grey-brown wing membrane is attached to its ankle. This species occurs mostly in lowlands, and other water-rich areas. During summer it roosts in buildings (e.g. attics, church towers, cavities), while in winter it prefers caves, mines and bunkers. Although males are more solitary, maternity colonies can reach 400 female individuals. When compared to M. daubentonii, the flight of M. dasycneme is faster and slightly higher. Similarly to other trawlers, the Pond bat uses its tail membrane and feet to catch its prey from the water surface. It feeds primarily on aquatic insects but can also enjoy moths, spiders and other Diptera, which it catches while flying over meadows. This is a migrant species, which can fly up to 300 km between roosts. 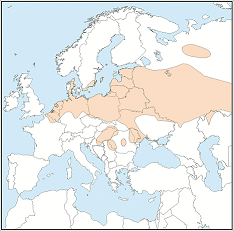 M. dasycneme is patchy distributed in Europe. It ranges from northern France through Belgium, Netherlands, Denmark, southern Sweden, along central Europe and the Baltic States to Russia. The southern distribution reaches northern Croatia and Romania. In the past, threats to this species included roost obstruction and use of toxic timber treatment chemicals. Since it has a rather low population density, M. dasycneme is particularly vulnerable to any threat.